Have you recently rented an apartment in Boston? Are you looking for things to do in Boston on a budget? Let us help you! Boston is one of America’s most diverse and exciting cities. Few other cities can compare to the storied past of Boston. It’s got its own history and culture that make it one of the best places to live. Better yet, it can actually be quite affordable if you know where to look. While many associate Boston with high culture, the Boston Tea Party, or the Red Sox, there are so many hidden areas to discover in the beautiful city. Whether you’re here for a day or you’re looking to become a new resident, finding the best of Boston doesn’t have to break your budget. Here are some of the best things you can do in Boston on a budget! The first thing you’ll want to do after moving to Boston is to walk the Freedom Trail. This 2.5-mile trail is sure to transport you back to the Revolution and America’s founding. Best of all, you get to choose how you want to experience it. While you’re free to check out the sights and sounds of Boston’s past alone, you can also sign up for a free walking tour. See 16 landmarks such as Paul Revere’s home, Old North Church, and the USS Constitution. The city of Boston is synonymous with freedom, and now you’ll get to relive it from the beginning! As you walk along the Freedom Trail, you’ll no doubt want to stop and visit Bunker Hill and the Bunker Hill Monument. 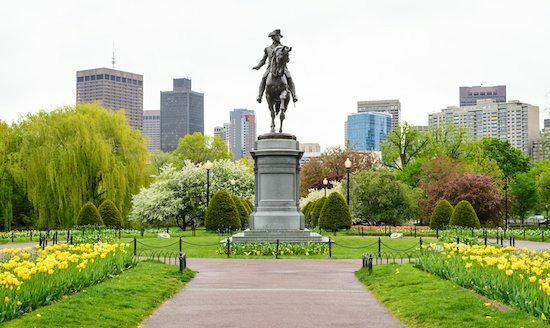 History buffs are especially in for a treat, as Bunker Hill was the site of the first major battle in the Revolutionary War. Best of all? It costs nothing to check out. You’re even free to climb up the monument via a set of stairs within the monument. If you’re looking to up your social game, you’re also free to just hang around the monument and take in the culture. Say hello to your fellow Boston residents and enjoy a gorgeous day in the city. If walking isn’t your thing, you’ve still got plenty of ways to experience Boston on a budget. One of the best ways to do so is by doing some light reading at the Boston Public Library. Boston Public Library is a fascinating area, but it’s so much more than just a library. Whether you’re there for the reading or to experience one of the dozens of weekly events, you’re in for a treat. Signing up is entirely free, so all you have to do is show up! It’s hard to choose just one museum to see when you’re in Boston on a budget. Luckily, you don’t have to choose. Many are actually within a short distance from each other, so take a day and visit a few. Like with most aspects of Boston, there’s a little bit of something for everyone. Tickets for most of these museums are usually just a few dollars. Maybe spending a relaxing afternoon in the park is more your style. If that’s the case, grab some snacks, a drink, and a blanket and head to the Boston Common. The Common is Boston’s most famous park and is absolutely free to enter. All you need to do is provide the food and company and let the city do the rest. And if you’re lucky enough to live in Boston, there’s a good chance it isn’t terribly far from your apartment complex. One of the most famous areas within all of Boston — and the world for that matter — is Harvard. This world famous university is home to some of the world’s most promising scholars. And like with every great college campus, you can experience the best of the city just a short walk away. Boston Square is Boston’s answer to Times Square, so expect to spend a bit more time here taking in the sights. While there are tons of shops and restaurants, you’re here to find out about Boston on a budget. We’d recommend checking out the calendar of events to see what free events are coming up. We’d be remiss if we didn’t mention the beloved Fenway Park in this list. It’s one of the world’s most famous baseball parks and is home to Boston’s crown jewel, the Red Sox. And while Fenway isn’t usually associated with Boston on a budget, there are some cheap ways you can get in on the fun. Bleacher seats near the top of the stadium are a great way experience the fun of a Red Sox game in their home stadium. You can take in a game for around $20-$40 per ticket. What’s a list about Boston on a budget without at least one date night idea? You can woo that special someone by renting a rowboat and rowing around the gorgeous Jamaica Pond. Boat rentals start at just $10 an hour. If you’re a fan of beer, you’ll want to make a beeline to Boston Beer Works. With 2 locations (one near Fenway Park) you’ll want to make sure you stop in for a drink and a snack. The Beer Works offers a variety of specialty craft beers that you can’t get anywhere else. We recommend the Nitro Milk Stout! Be sure to check out their menu to see what the latest and greatest R&D beers are. You can try tomorrow’s hottest beers before they even hit the market. If you’re a regular reader, you’ll remember that we mentioned Roxy’s Central a few months ago. Whether you visit the food truck or the Central location, you absolutely need to visit. Roxy’s specializes in grilled cheese. But not just any grilled cheese, specialty grilled cheese! Rethink this childhood staple by biting into one of these gourmet sandwiches. We’re practically salivating just thinking about it. As you can see, even if you’re checking out Boston on a budget, there’s still tons to do! And if you’re looking for a place to live, be sure to contact us today to see about our apartment offerings. Welcome to Boston, we know you’ll love it here!